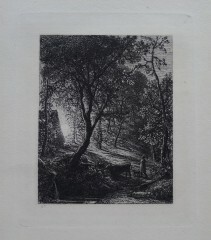 Samuel Palmer, painter and print maker. He was a bookseller’s son,was a delicate and withdrawn child who began a love affair with poetry that remained a lifelong inspiration for his art. Despite studying with a drawing master, he was mostly self-taught. Precocious, he exhibited at the Royal Academy at the age of fifteen in 1820.In 1822 Palmer met artist John Linnell. Linnell was a wealthy man and took Palmer under his wing, introduced him to the art of such masters as Albrecht Dürer, but more importantly introduced him to the contemporary visionary artist William Blake, whom Palmer met in 1824. Blake became his hero. Due to poor health Palmer, his father and nurse left London and moved to Shoreham, near Sevenoaks in Kent in 1826. He created his most visionary Romantic landscapes in Shoreham. He became the central figure in a group of artists including Edward Calvert, John Varley and Linnell who called themselves ‘The Ancients’ as their aspirations focused on ancient poets and painters. In 1835, Palmer returned to London and married Linnell’s daughter Hannah in 1837. They began their married life together by travelling around Italy for two years. This gave Palmer the opportunity to paint and visit the local galleries. Despite membership in the Old Water-Colour Society and the Etching Club, Palmer had few patrons; he primarily earned his living by teaching drawing. Palmer used whichever medium met his needs: oil painting, watercolour, or drawing. He often experimented, using wash mixed with soot, blended gum arabic, or even flour, or sometimes adding water and gouache for density or texture. He frequently finished only parts of his drawings. In 1848 Palmer moved to Kensington to be closer to the countryside. 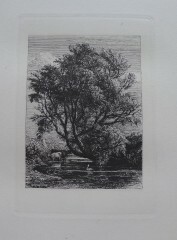 After the death of his oldest son in 1861 and economic worries of a purchase of a villa in Redhill, Surrey ,he started a series of etchings made to accompany his own translation from the Latin of Virgil’s ‘Eclogues’. Unfinished when he died, his son A.H.Palmer completed and published the book in 1883.